You are here: Home / Skydiving Information / Best Time To Go Skydiving? For avid skydivers the only answer to that question is “when the door of the plane is open”. Ask any regular skydiver and they’d admit that there are better times of the year to go skydiving. The mornings are cool, the afternoons are warm, what else could you ask for? Spring is a good time to go skydiving, of course. The views are great with the trees blossoming, the grass turning green, the skies are starting to clear. If you want to get your early summer kicked off, this is the time to do it. It’s a great way to spend spring break. In most parts of the country, it’s hot. In some places it’s very hot. That can mean the inside of the plane can be uncomfortably warm at times. Some pilots allow the plane door to be opened after 1000 feet. Open door in flight? Yes. Don’t work, if you fallout, you have a parachute! The skies are often clear. Occasionally, afternoon thunder showers shut the drop zones until the rain passes. You’ll be reward for enduring a warm plane ride by cool air when you jump from the plane. The air can be 30 degrees colder. If you like to see fall colored trees and enjoy cooler temperatures, fall skydiving is for you. The days aren’t as hot but the change in seasons can bring wind and clouds. Drop zones shut down wind the wind gets to about 20 mph. Drop zones are typically less busy during the fall. It’s a good time to make your first jump. Schedule your skydive for the morning in case there is bad weather early in the day and plan on being there all day. On cooler days be sure to wear long pants and bring a fleece or sweatshirt for the jump. 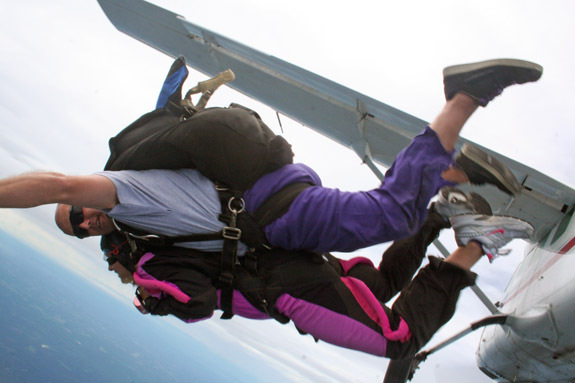 Most first-timers don’t skydiving in the winter. It’s safe to jump in cold temperatures but it may not always be comfortable. If it’s 40 on the ground it could be 10 degrees or colder at jump altitude. If you want to jump over the winter, be prepared and dress warmly. Some avid skydivers have been known to wear three pairs of gloves to jump in the coldest months. The best time to skydive is whenever you want to go. Each season has it’s pluses and minuses. If you want to jump go for it. Skydiving is more fun when you have a group of 3 or more. You’ll have fun sharing stores and talking about your jump. You might have better luck getting your friends to jump in the warmer times of the year. If you want to jump, call a drop zone and get your “knees in the breeze”! Copyright SkydivingDropzones.com, 2012. All Rights Reserved.